October, 2nd 2017-RACK Digital invited International Wellbeing Center (IWC) to give a wellness talk in their Darmawangsa office. Despite the hectic workload, they wanted to help the employees to have a healthy lifestyle. IWC was there to carry a holistic workshop that covers mind, body and soul topics. “The Art of Mindful Living and Eating” is basically discussing the importance of sleep, mindfulness and eating healthy to keep the mind and body stay healthy, balanced and productive. Our Life coach and Yoga instructor Rini Haerinnisya opened the workshop by introducing the art of mindful living. A productive and healthy life is very easy to start only by having enough relaxed sleep. Human’s cells are being repaired and regenerated during rest hours. However, work and life are often taking away our precious sleep. Rini taught the audience how to brain hack their productivity by doing Yoga Nidra, a way of meditation that could be practiced as a middle point between calmly awake and deep sleep. To make it simple, Yoga Nidra is a way to utilize power nap into hours of relaxed sleep. She also explained the various benefits of Yoga Nidra to mental and physical health. Rini closed the living session by doing simple tricks of mindfulness to gain back focus and effectiveness at work, such as grounding exercise and monkey meditation for the active-minded young people. Simran Nanwani, our associate nutritionist continued the workshop by explaining the art of mindful eating. Good nutrition is vital to optimise productivity and effectiveness at work. The right foods nourishment to body and brain will positively affect how we feel, think, remember and create. Especially that our brains consume 20% of daily calories intake. In order to do this, we need to eat a balanced diet of fruits and vegetables instead of junk food, too much carb or sugar. A balanced and healthy diet will reduce risks of heart disease, stroke, cancers, obesity and a good source of vitamins and minerals. To fulfil this balanced and healthy eating, Simran taught the audience on what kind of food and menu that they needed to prepare. 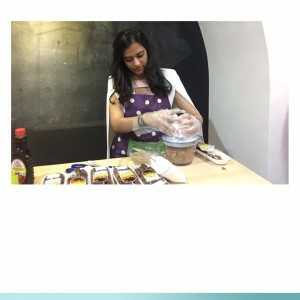 She continued the workshop by doing cooking demonstration and practice on making healthy snacks power balls and guacamole with the audience, She closed the workshop by giving the prize for the best snack team and creating a one month challenge of eating healthy to the employees.